After such a long winter, it’s hard to believe that spring is finally is full swing! We know that many of you have been anxiously awaiting fresh food from your gardens and the farmers market. Most produce from the grocery store just doesn’t match up to locally grown. We still have a bit of a wait here in Michigan for our staple vegetables to be ready for harvest, but in the meantime, take advantage of these abundant fresh herbs! 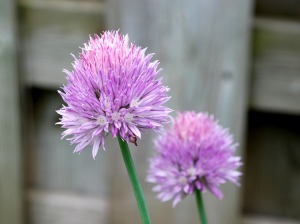 1) Chives – Chives are one of the first signs of spring. They are packed full of fresh green onion flavor and make a great addition to almost any dish. The flowers are edible too and have a sweet onion flavor. Use them as an accent in salads, sprinkle them on pork, chicken, or fish, or add as a garnish to your dish. 2) Basil – One of the most widely used herbs in existence, basil is an excellent addition to many meals. Add it to salads, soups and pasta, or pair it with pine nuts and parmesan to make pesto. There are dozens of different basil varieties available. Try Lemon Basil, Red Basil, or Thai Basil for a new, unique flavor. 3) Parsley – Parsley packs the most nutrients of all the herbs on this list. With several phytonutrients, iron, and an excellent serving of Vitamins A, C, and K – parsley can and should be added to almost any of your favorite dishes. Try hanging some to dry for fresh parsley flakes to use in soups or for longtime storage. 4) Thyme – Thyme is perfect for pairing with other herbs and creating seasoning blends for meats or a bouquet garni for soups and stews. The leaves are small and do not require much chopping. 5) Sage – Fresh sage is a real treat in the kitchen. It has a delicate flavor and should only be added near the end of cooking to retain it’s essence. Use it in soups, salads, sauces, and seasonings. Note that all of these herbs can easily be grown in a pot on your kitchen windowsill for easy care and consumption. Happy seasoning!